An unarmed black man killed by a white Oklahoma officer who was responding to a stalled vehicle can be seen in police video walking away from officers and toward his SUV with his hands up before he approaches the driver's side door, where he drops to the ground after being shocked with a stun gun then fatally shot. An unarmed black man killed by a white Oklahoma officer who was responding to a stalled vehicle can be seen in police video walking away from officers and toward his SUV with his hands up. In the video, the man then approaches the driver's side door, where he drops to the ground after being shocked with a stun gun, then fatally shot. 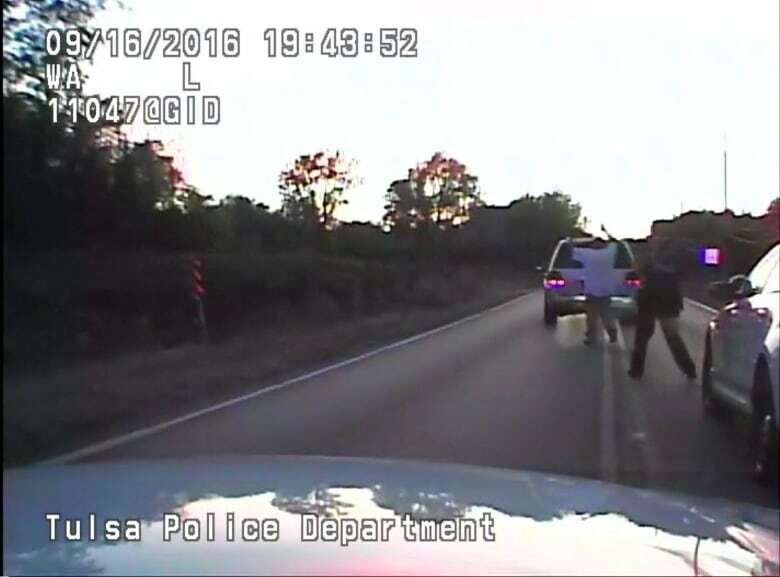 In Tulsa police helicopter footage that was among several clips released Monday showing the shooting of 40-year-old Terence Crutcher and its aftermath, a man in the helicopter that arrives above the scene as Crutcher walks to the vehicle can be heard saying "time for a Taser." THE CURRENT l Black officer speaks about race, policing in U.S. It's not clear from the footage what led Betty Shelby, the officer who fired the fatal shot, to draw her gun or what orders officers might have given Crutcher. Local and federal investigations are underway to determine whether criminal charges are warranted in the shooting or if Crutcher's civil rights were violated. "The big bad dude was my twin brother. That big bad dude was a father," she said. "That big bad dude was a son. That big bad dude was enrolled at Tulsa Community College, just wanting to make us proud. That big bad dude loved God. That big bad dude was at church singing with all of his flaws, every week. That big bad dude, that's who he was." After that someone on the police radio can be heard saying, "Shots fired. We have one suspect down." Officer Tyler Turnbough, who's also white, used a stun gun on Crutcher, police said. The shooting comes just four months after former Tulsa County volunteer deputy Robert Bates was sentenced to four years in prison on a second-degree manslaughter conviction in the 2015 death of Eric Harris, an unarmed black man. Shelby worked as a Tulsa County sheriff's deputy for four years before joining the Tulsa Police Department, officials said. She has been placed on paid leave. The initial moments of Crutcher's encounter with police are not shown in the footage. Shelby did not activate her patrol car's dashcam, said police spokeswoman Jeanne MacKenzie, and the ground-level video released Monday came from the car of a second officer who arrived at the scene. After the shooting, Crutcher could be seen lying on the side of the road, blood pooling around his body, for nearly two minutes before anyone checked on him. When asked why police did not provide immediate assistance once Crutcher was down, MacKenzie said, "I don't know that we have protocol on how to render aid to people." What does it mean when we say certain lives matter? 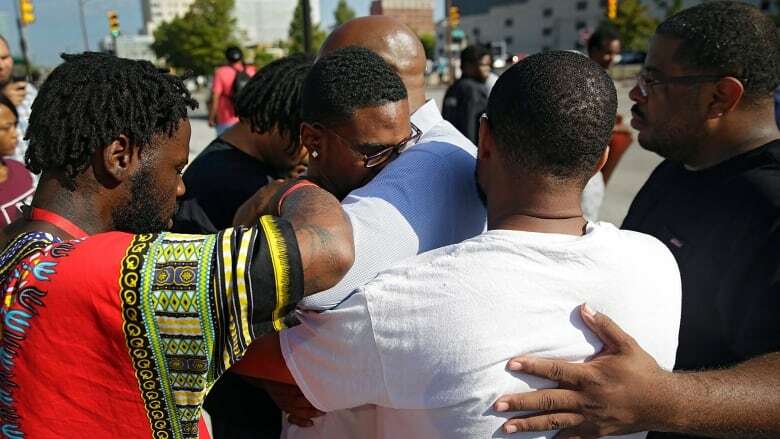 "This is bigger than us right here. We're going to stop it right here," she said. U.S. Attorney Danny C. Williams said the Department of Justice's civil rights investigation into the shooting will be separate from a local one into whether criminal charges should be filed. "The Justice Department is committed to investigating allegations of force by law enforcement officers and will devote whatever resources are necessary to ensure that all allegations of serious civil rights violations are fully and completely investigated," he said. 49er QB Kaepernick's anthem protest sets off firestorm in U.S.
Black officer speaks out about race and policing in the U.S.